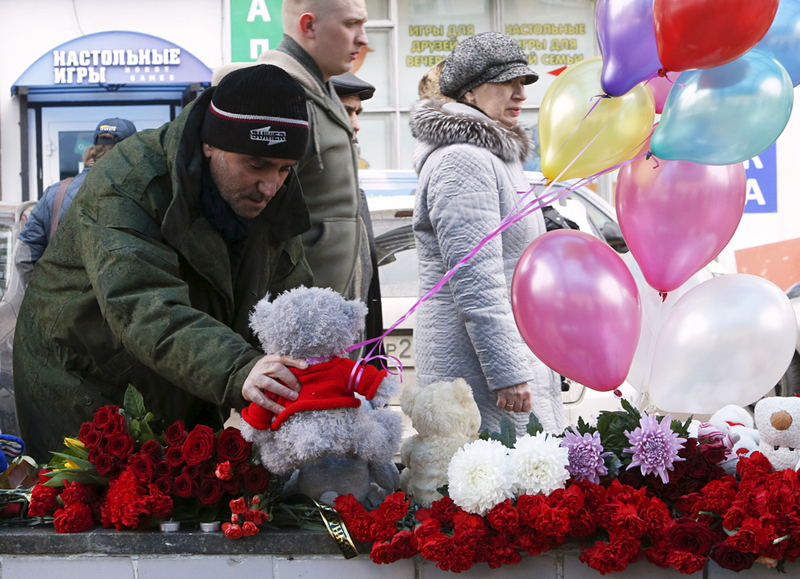 A man places a toy among flowers as people come to commemorate recently murdered child near the Oktyabrskoye Pole metro station in Moscow, March 1, 2016. Moscow residents are bringing flowers to the Oktyabrskoye Pole metro station to pay tribute to a young girl whose nanny was detained near the metro station on Feb. 29 with the girl's severed head in her hands. Citizens have laid flowers, some with black ribbons, as well as soft toys, chocolate, candies and candles near the entrance to the metro station. The decapitated body of a four-year-old girl was found after a fire in an apartment on Narodnogo Opolcheniya Street in Moscow on Feb. 29. Later, the girl's nanny, 38-year-old Gulchekhra Bobokulova from Uzbekistan, was detained near the Oktyabrskoye Pole metro station with the girl's head in her hands. She admitted to murdering the girl. An informed source told Interfax that the police had acted to prevent possible xenophobic responses from citizens after the murder of the young girl in northwest Moscow. The measures were taken on Feb. 29 "for fear that radical nationalist groups might become active due to the high-profile crime," he said. The preventive measures have mostly been taken in relation to leaders of youth movements, he said.